Clinically proven to kill lice and eggs including super lice. Applies like a mousse. Rinses out easily. Vamousse Lice Treatment is available without a prescription and over the counter nationwide in retail pharmacies and online. Saturate all hair and scalp, massaging the mousse to break down the foam, thoroughly soaking the hair. To be effective all lice and nits must be contacted. Depending on length of hair, the full can may be needed. Vamousse may be repeated as needed. Children under 2 years: ask a doctor. Vamousse Lice Treatment is pesticide-free and kills head lice and eggs by dehydration using the active ingredient Natrum Muriaticum (sodium chloride). Since traditional lice treatments kill adult lice using a pesticide-based neurotoxin, they have limited or no ability to kill yet undeveloped eggs (nits). This means a second treatment is part of the instructions, in order to kill lice as they hatch 7 – 10 days later, before an infestation can be ended. Vamousse uses a different mode of action to kill lice and eggs both in the same application. The protective lipid layer of the adult lice is compromised by the advanced formulation to rapidly deliver the active ingredient to the louse, causing a rupture of the intestinal tract followed by dehydration. Eggs are similarly dehydrated, rendering them no longer viable. Studies have identified strains of head lice in some U.S. regions that have become increasingly resistant to pyrethrins and permethrin, the active pesticide ingredients in most over-the-counter head lice treatments. These lice have been called super lice since they are harder to kill with traditional pesticide-based products. 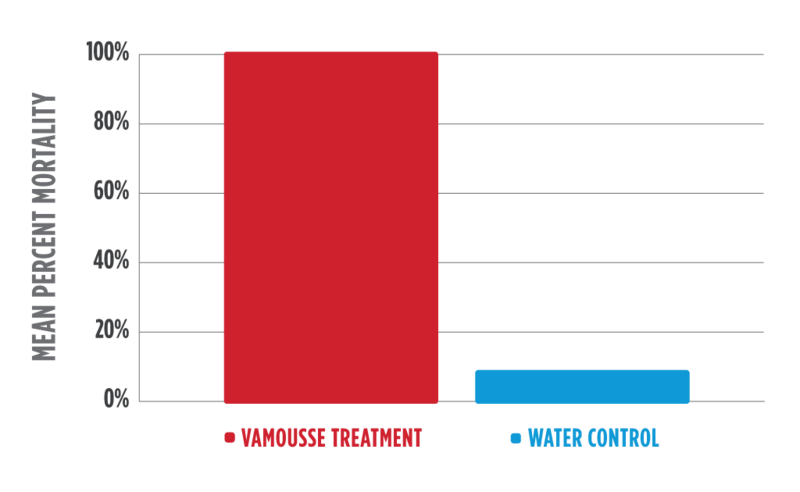 Vamousse Lice Treatment is pesticide-free and relies on active ingredient Natrum Muriaticum (sodium chloride). Because it’s pesticide-free, Vamousse has no pesticide-resistance issues. Vamousse has been proven effective against super lice in a clinical trial. Vamousse Lice Treatment is clinically proven to kill both lice and eggs in one treatment – even super lice.1 It works by compromising the outer protective layer of lice and their eggs, allowing exposure to the active ingredient, Natrum Muriaticum (sodium chloride). This ingredient kills by dehydration and osmotic stress, leading to gut rupture.2 Read more about this physical mode of action and clinical trial results here. Six replicates of 10 lice each were performed [for both the product and control]. 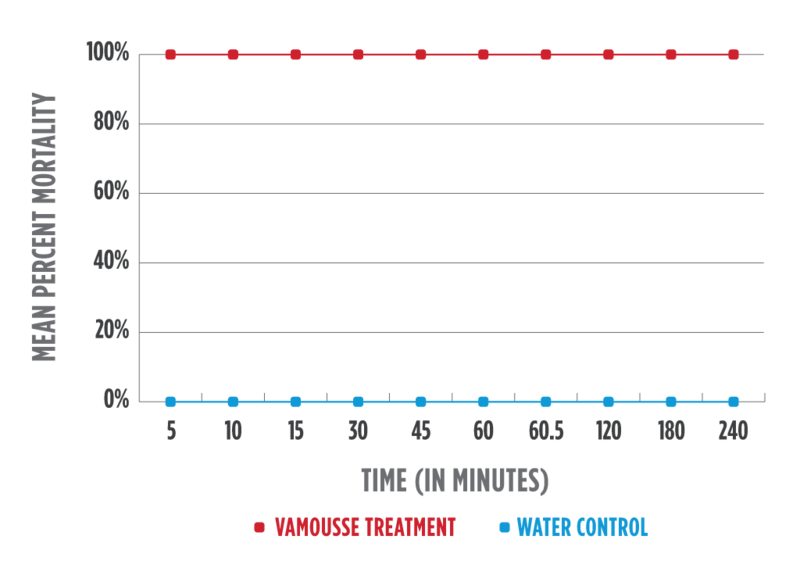 The test exposed the lice to Vamousse Lice Treatment for 15 minutes, per product instructions, followed by a warm water rinse. 100% of treated lice were confirmed dead 24 hours after this single application. I used the Vamousse Treatment, does the mousse kill eggs in addition to lice? Vamousse Treatment has been clinically proven to kill BOTH lice and their eggs (read more about how it works here). For best results, shake the Treatment can well prior to use and fully saturate the hair and scalp to ensure ALL lice and eggs come into contact with the product and remain in contact for 15 minutes. How does Vamousse Treatment work? Vamousse Treatment uses the active ingredient Natrum Muriaticum to kill lice and eggs by dehydration. The unique formula uses an innovative technology to remove the outer protective layer of lice and their eggs, optimizing the activity of the active ingredient to dehydrate lice, ultimately resulting in death. Can Vamousse Treatment be used on "super lice"? “Super lice” is a term being used to describe strains of head lice identified in many states in the U.S. that have become genetically resistant to the pesticide-based active ingredients (permethrin and pyrethroids) used in many over-the-counter head lice products. Vamousse Treatment is pesticide-free and therefore has no pesticide resistance. Regardless of where you live, an effective, safe, pesticide-free treatment is a very practical option and available over-the-counter without a prescription. I recently used another type of lice product and it did not work. Can I use Vamousse immediately following the other product or is there a waiting period? Vamousse contains safe, non-toxic ingredients which do not require a waiting period before use. No comb was included in the Treatment box I purchased. What can I do? Your quickest option will be to return the product to the store for a refund or exchange, if another box with a comb is available on the shelf. Alternately, we will be happy to mail you a comb. Please note that this may take up to 2 days to arrive, however. Please contact us at 1-855-373-7210 if you want to report the missing comb and request a replacement. How long can I leave Vamousse Treatment on? Vamousse needs to be in contact with all lice and eggs for 15 minutes, however, if you need to leave it on longer for any reason you may. How often can I use Vamousse Treatment? Vamousse contains safe, non-toxic ingredients and no pesticides, so it can be applied as often as needed without a waiting period to treat a reinfestation or any lice or eggs missed during a prior treatment. When does Vamousse Treatment expire? The date on the bottom of the can looks like it is past its expiration date? Vamousse Treatment has no expiration date. You will see a sequence of letters and numbers printed on the bottom of the mousse can that sometimes is mistaken for an expiration date. This code is a manufacturing lot/batch code, not an expiration date. Since Vamousse Treatment kills the eggs, do I need to remove the eggs that are still attached to the hair shaft or will they eventually fall out on their own? Vamousse does not remove the nits. Due to the strength of the “glue” that lice use to attach their eggs to the hair shaft, even dead eggs/nits will remain attached after treatment. Following the instructions, use the Vamousse lice comb, included in the package, to remove dead lice and nits. I used the Vamousse Treatment exactly as directed and still see live lice or nits in the hair. What happened? It is possible that the product did not contact with ALL of the lice and eggs. For best results, the treatment canister must be shaken well prior to use and ALL lice and eggs must come into contact with the treatment by fully saturating the hair and scalp for 15 minutes. Ensure that areas behind the ears, at the nape of the neck, and down to the roots remain wet throughout the treatment. And keep in mind that even dead nits/eggs can remain attached after treatment. I used Vamousse Treatment, but it didn’t work. As a reminder, use one whole can of treatment per person and make sure the hair and scalp are completely saturated throughout the 15-minute treatment period. 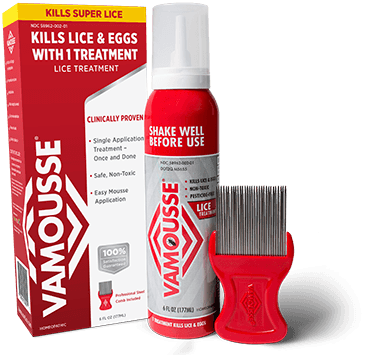 Vamousse must come in contact with all lice and eggs to be effective. Be sure that you shake the mousse can well before application. If hair is becoming dry before you complete the application and begin to comb, apply more product to the hair and scalp. Follow the instructions on the pamphlet included in the box to ensure you haven’t missed any steps. Use the included Vamousse lice comb to thoroughly eliminate dead lice and nits following treatment to ensure maximum efficacy. And keep in mind that even dead nits/eggs can remain attached after treatment. Read about our Satisfaction Guarantee here. Is Vamousse safe to use during pregnancy or while breast-feeding? Vamousse products are made with safe, non-toxic ingredients and pesticide-free; however, if you are pregnant or breast-feeding, we recommend seeking advice for your particular situation from your health care professional before use. Is Vamousse Treatment safe to use on children younger than 2 years of age? Vamousse products are made with safe, non-toxic and pesticide-free; however, we recommend seeking advice from your healthcare professional before use on a child under 2 years of age. I used the Vamousse Treatment, can I follow with my regular shampoo and conditioner? Yes, after using Vamousse Treatment you can resume using your normal daily shampoo, conditioner, styling product, etc. as desired. Can I use Vamousse products if I have asthma? Vamousse’s formulations are water-based, rather than alcohol-based; however, we recommend seeking advice from your healthcare professional before use if you or your child has asthma or COPD. Can I use Vamousse products if I have eczema? We recommend seeking advice from your healthcare professional before use if you or your child has eczema. Is Vamousse Treatment safe to use on color treated hair? We recommend testing a small, inconspicuous section of your hair before using Vamousse if you have color-treated hair. The active ingredient is a sodium chloride solution that may decrease the vibrancy of some hair colors. Can I use Vamousse on my pet? Vamousse is only intended for use on humans to treat head lice. It is not intended to use on pets. How long after using Vamousse Treatment do I have to wait to go swimming? You can go swimming any time after washing the Vamousse Lice Treatment mousse out of the hair following the treatment instructions. Does Vamousse Treatment work on fleas, scabies, or pubic lice? Vamousse Lice Treatment has only been tested and proven effective against head lice. It is a topical solution intended for use on human heads. I used Vamousse Treatment and am having a skin reaction (dry skin, peeling, itching, redness, rash, etc.). Is this normal? If you are having any suspected reaction to the use of Vamousse, contact a healthcare professional and provide the ingredient list from the package for their evaluation in your situation. In some cases, where the scalp may be sensitive from the lice infestation already, Vamousse can have a drying effect, causing some itching or redness of the skin. Using a deep conditioner after treatment can help to moisturize the hair and scalp. Please contact the Vamousse Customer Support Team at 1-855-373-7210 to report any adverse reactions. Can I apply Vamousse Treatment to areas of the body other than the head? Vamousse Lice Treatment is intended for use only on the head, including the scalp and hair. Do not use the product on eyebrows, eyelashes or in the pubic area. See a doctor if lice are present in these areas. Full study data is available on file. Read summary of lab studies and a clinical trial here. Yoon, K.S., Previte, D.J., Hodgon, H.E., Poole, B.C., Kwon, D.H., Abo El-H Lee, G.E., Clark, J.M. (2014) Knockdown resistance allele frequencies in North American head louse (Anoplura: Pediculicide) populations. J. Med. Entomol. 51: 450-457.